Jean-Marc Gales: "This year is the year of profitability." It’s been a little more than two years since seasoned auto executive Jean-Marc Gales took over as CEO of struggling British sports car maker Lotus. When the former Opel, Mercedes-Benz and PSA Group executive arrived there was no money to replace Lotus’ aging three-model range. That forced him to cut costs while also finding ways to inexpensively enhance his portfolio to achieve his goal of making the company profitable. Gales expects to reach the key target in Lotus’ current fiscal year, he told Automotive News Europe Correspondent Nick Gibbs. Are you closer to profitability? We will be profitable this financial year that started in April. We had a three-year plan from when I arrived in 2014. The first two years were basically building up, this year is the year of profitability. I can’t give any numbers, but we are better than the year before. We are continuously improving as 2013 was better than 2012, 2014 was better than 2013, 2015 was better than 2014. Now comes the big year 2016-17 where we will be profitable. What does that mean in models sold? Probably 2,200 to 2,300 in this financial year. But we believe we could do even more because we will have the full-year effect of the U.S., where we launched the Evora in May and we expect sales of 400 cars. We already have 250 orders. Will all U.S. sales be Evora coupes? Yes. The roadster will arrive about a year after the coupe. Right now almost the whole factory is [building] U.S. orders. Are you still cutting costs? We are continuing with the cost-cutting exercise. The worst is behind us, but it’s a continuous exercise to review costs. 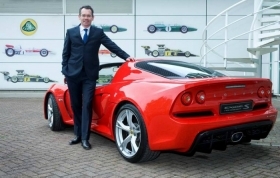 MAIN CHALLENGE: Successfully returning to U.S with the revamped Evora and turning a profit after two decades of losses. What are your targets on that front? The last two years we have achieved them. We are very lean. We have about 900 staff now, down from more than 1,200. We have reduced the number of hours it takes to build each car by 10 percent. We are continuously looking at reducing cost of the parts. It was one of the prerequisites of becoming profitable, and we will get there -- after 20 years of not being profitable. Is the Elise or Evora your top-seller? The Evora will be our biggest seller this financial year with its entry into the U.S. Next year it will be Evora as well. When we last spoke you were about to finish a prototype SUV to show to Chinese authorities with a view to making it there. How did that that go? We are making progress. I won’t say more, but it’s going well. How is the development of the new architecture going? There’s so much life left in the current one. There will be a new architecture coming but give us another four years for the [Elise] small car and a bit longer for the [Evora] large car. The basic architecture is 20 years old, yes, but the Porsche 911 architecture is 50 years old and that’s still going strong. We’ve continuously updated it. Look at all the competitors who try to copy our cars. Either they get too heavy or too slow or both. Will you stick with aluminum for the next architecture? Probably. It’s what we do best. I like it because it’s so flexible, on the same car you can do both open or closed. It gives you so much more flexibility than a carbon chassis. We are still working on reducing the weight. When will you upgrade the Elise? I can’t give a precise date, but I can say will upgrade the Elise before the new architecture comes. We have concrete ideas of what we’re going to do with the car regarding improved infotainment, lower weight and more power. Will you sell that car in the U.S.? No. But with the next architecture certainly. We currently offer the Evora and we will also offer the [more powerful] Evora 410 Sport in the U.S. Then the roadster. Three different cars. How is business for Lotus Group’s engineering arm? It provided turnover of 10 to 15 million pounds, which is up from last year. That’s about 10 to 15 percent of our total turnover. Does a hybrid powertrain make sense in a Lotus? For a sports car, no. For an SUV, yes. Why add two powertrains and batteries when I can add one powertrain and optimize. It would be completely against Lotus’ philosophy of lightweight. It would add 100kg of batteries and 50kg for the second drivetrain. Hybrid is favored by the current emissions cycle. When the emissions cycle changes it won’t be favored as much. Lotus has battled with the EU over emissions. Have you been given a target? We fall under the small manufacturer clause like McLaren and Aston Martin. However, in the U.S. we need to fulfill some reductions. Over a five-year period, we need to show a gradual 3 percent-per-year reduction. We can get there. In Europe we are working on remapping the electronics and reducing weight. How can you get 3 percent out annually? One option is to take out the supercharger [from the Evora’s Toyota-sourced 3.5-liter V-6]. Another is to go for extreme lightweight, but that is in our DNA anyway. The third is have longer gear ratios, which I don’t like much because it takes away the liveliness of the car. I don’t believe a four-cylinder fits there.